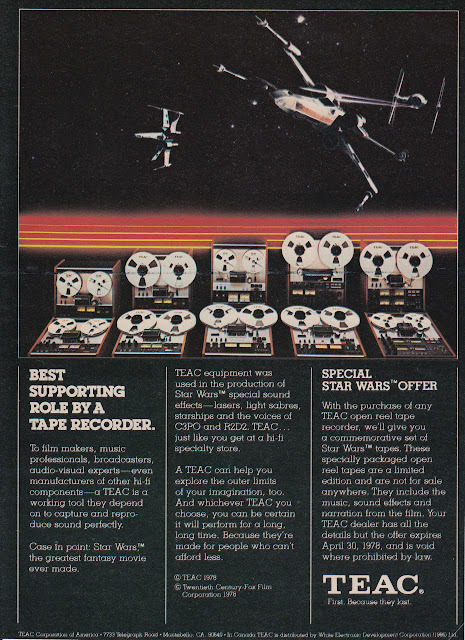 With the purchase of any TEAC open reel tape recorder, we’ll give you a commemorative set of Star Wars tapes! These specially packaged open reel tapes are a limited edition and are not for sale anywhere. They include the music, sound effects and narration from the film. Your TEAC dealer has all the details but the offer expires April 30, 1978! Oh. Sorry. Guess we missed that great offer. I recall that my dear old papa had a reel-to-reel tape deck when I was a wee lad. I must admit that as tape machines go, they certainly did give one the sense of awesome professionalism in a way that cassette tapes just could not touch. Though I daresay they wouldn’t stand a chance if they were really under attack by those x-wing fighters. I’ll bet Vader had a TEAC. 1967 Campbell’s Soup – Mighty Mousse! Golden Oldie Ads · A collection of favorite ads from a periodically obsessed collector of such things.